Metal detecting headphones I believe are a necessity, a good set of headphones can be the difference in hearing a target and missing a target. In this post, we will just be talking about the best metal detecting headphones. 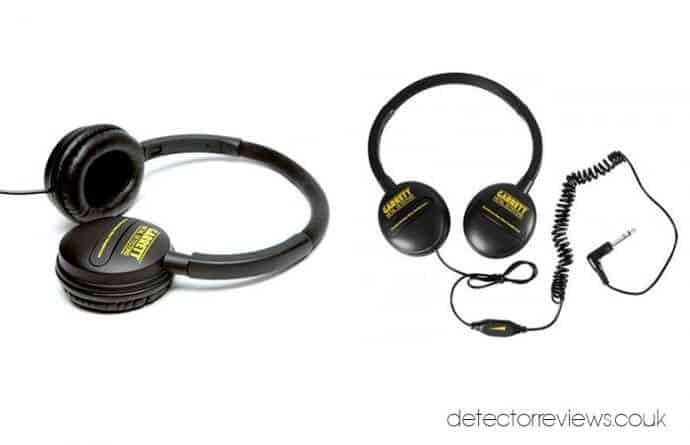 There are many types of metal detector headphones on the market, some that are specifically designed with the purpose of metal detecting in mind and for use with specific detectors. Metal detecting headphones that have been designed for metal detecting will increase the audio response and allow you to better hear the signals sent from the detector, a lot more information on whether the target is good or bad can be received from hearing the signal tones. Then there is the matter of preference, do you prefer bigger headphones that cover the ear completely? Do you like in-ear ones with buds? Do you prefer ones that rest on your ears? Or would you like to have a set of wireless headphones? Wireless headphones will stop that pesky cable getting in the way, and stop you from getting snagged, making them my favourite type of headphones for metal detecting. It’s probably one of the most annoying things for me when I am using a metal detector, the headphone wire dangling in front of you, tripping over it or having to take off the headphones each time you put the detector down to search in the hole. Before you choose your headphones for metal detecting you need to gather some information and ask yourself some questions. Do you have volume control on your metal detector? If the answer is no then you’re going to want to make sure that the headphones you choose have volume control. The majority of metal detectors are fitted with a 1/4 inch headphone socket, but many headphones are fitted with a 1/8″ jack plug. So if this is the case then you’re going to need to make sure you have the jack converter. What is your budget? Are you prepared to spend a little extra for comfort and quality? Or are you limited and looking for the most bang for your buck? In usual “detector reviews” fashion I’m going to list a few of the best metal detecting headphones along with some information on each. I’ve tried to add a variety of different sized budgets. 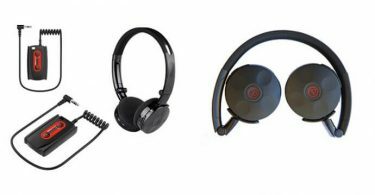 All of the following headphones have received many positive reviews and are of the best quality. I would never recommend any products that haven’t been carefully researched or tested. 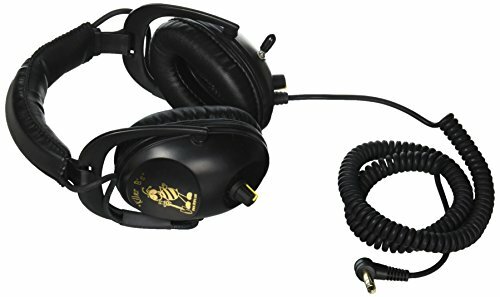 What are the best Metal Detecting Headphones? 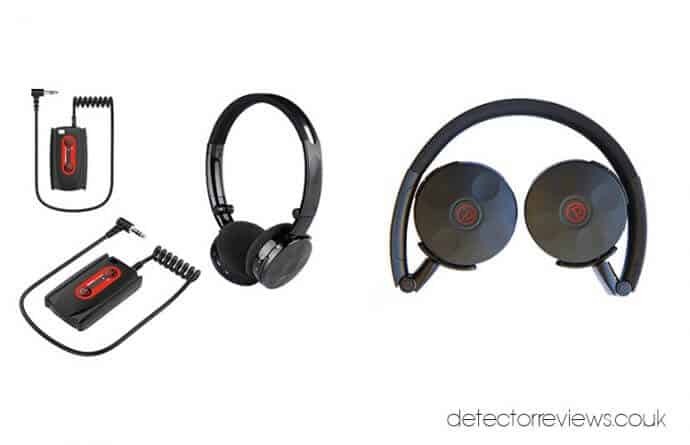 Garrett Clearsound Easy Stow Headphones are a budget metal detecting headphone recommendation. They feature a flexible coiled cord that can extend up to 82″ so there is plenty of room for movement. Vinyl padded earpieces which can rotate to flat so they can be easily stored/transported. Inline volume control for increasing or decreasing the volume. 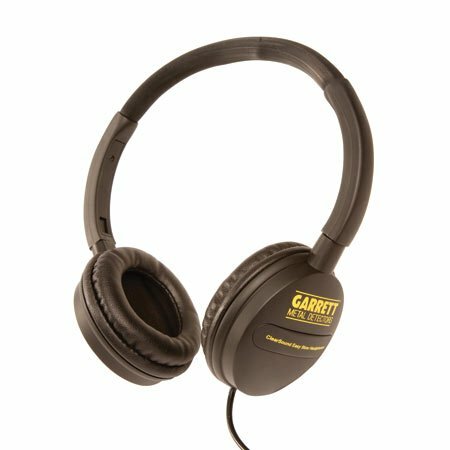 The Garrett Easy Stow headphones are lightweight and have a rather comfortable vinyl padded ear cup. The band that goes over the top of your head is also padded for maximum comfort. Sound wise they are nice and clear and block the majority of “outside” noise. There’s plenty of room for movement with the 82″ (fully expanded) coiled cable. The coiled wire helps eliminate the snagging problems. I’ve had them before and as I recall I got them free with the Garrett EuroAce as part of the package. 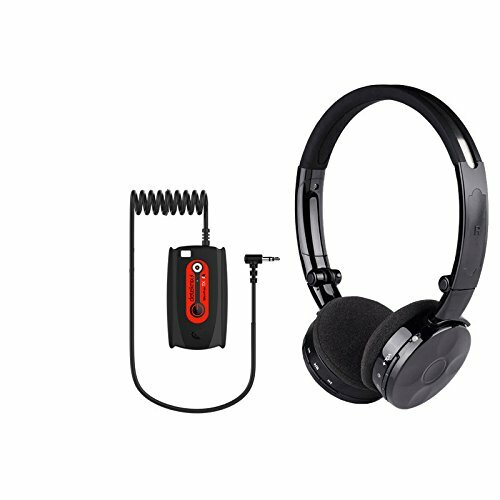 If you’re looking for a set of reliable metal detecting headphones that are comfortable and you’re working on a budget. The Garrett Clearsound Easy Stow headphones are a great choice and a more than fair price. Loud, clear, comfortable and no-frills metal detecting headphones that are probably the number one choice when working with a budget. Deteknix W3 Wireless headphones now known as Quest W3 Headphones are a universal wireless metal detecting headphone. These are my personal preference. These are the headphones I own. Padded earpieces and fully foldable for easy storage. Simple controls, power on button and volume control on one earpiece and skip forwards/backwards and play on the other just in case you want to use them for listening to music! Wireless up to 10 meters. The Deteknix W3 Wireless headphones are ultra lightweight weighing just 115 grams. They fit snug onto the head and have an adjustable headband for increasing or decreasing the size. Very loud, that loud in fact that you’re not going to want them on full volume. Very clear you hear everything making them a great choice for features like iron audio. No cables to worry about, the receiver transmitter fits nicely onto the detector it even has the pole groove moulded into it. They are auto-paired so you simply switch both the headphones and transmitter on and you’re good to go! They say there is a small lag, but believe me when I say you will not notice for me the signal from the detector to the headphone is instant. If you want to make your metal detecting experience far more enjoyable then I highly recommend these headphones, just removing the wire out of the equation makes everything so much better for me. If your budget allows you to spend a little more on metal detecting headphones then the Deteknix, or now known as the Quest W3 Wireless headphones are a great choice. 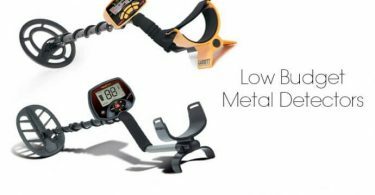 Before purchasing though make sure you have the right set for your metal detector, they are universal and they do offer a set of most machines. Check the connection on your machine, if you have got a Garrett AT Pro/Gold then they offer a separate version for these too. 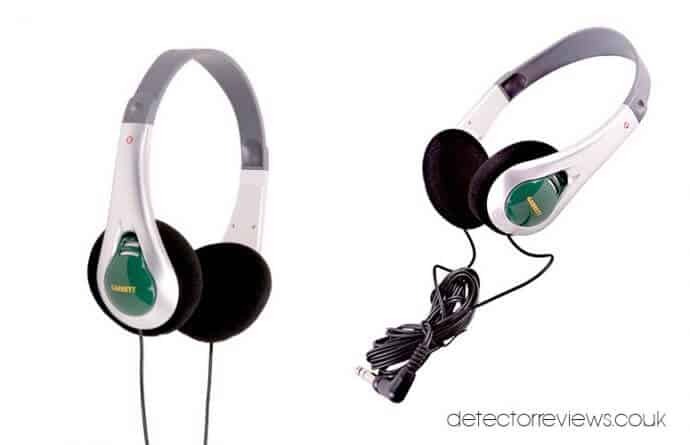 Slightly more expensive than the Garrett Easy stow, we have the Bounty hunter Head-PL metal detector headphones. 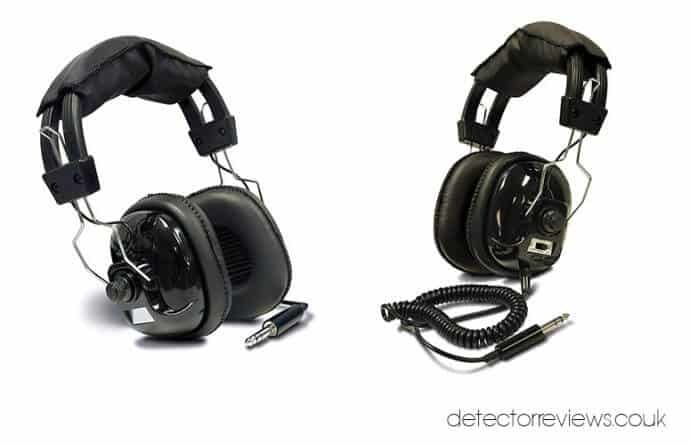 Designed truly for just metal detecting the Bounty Hunter headphones are very clear and loud, you’ll not miss any tones no matter how quiet or faint with these. The headband has a leather padded part so it doesn’t dig into your head and allows maximum comfort, the earpieces are well padded and surround the full ear so truly do block out all of the outside noise. I personally don’t like being able to hear anything but some people do prefer it. It’s all padded in soft leather. They are fairly lightweight as well at only 12.8 ounces. You have individual volume control on both earpieces and the Bounty Hunter headphones are true stereo sound. There’s even a switch to change over to mono. As standard, it’s a 1/4 inch jack but they do come complete with the 1/8 inch adaptor in the box! The cable is coiled to help reduce tangles and snags and fully expands to a very fair length giving you plenty of room to manoeuvre. Great sound, very comfortable and simple to use. 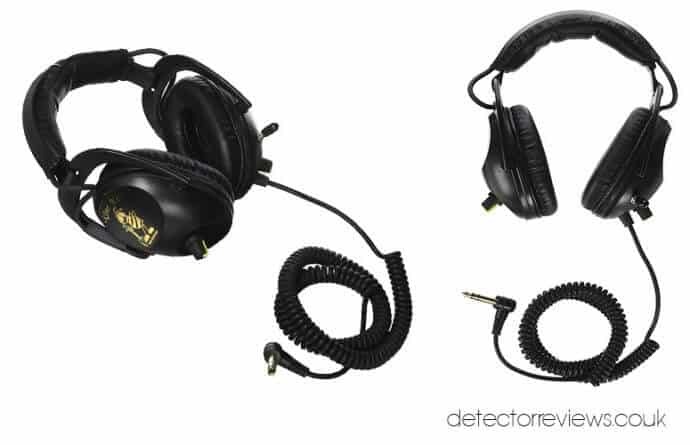 A very well received set of metal detector headphones, sturdy and reliable. They’ve been given very good reviews in numerous places on the internet. The design process has been thorough and they’ve given you all you can need in metal detecting headphones and more. They’ve also managed to make sure they are rugged and tough and will last you perhaps a lifetime! If not you always have the lifetime warranty to fall back on. There are 41 dual position volume controls, one on each ear. They have a high output 150 ω speaker elements too. Mode switch to make them more universal so you can switch between stereo and mono. Standard with a 1/4 inch jack you can pick up the 1/8 adapter for just a couple of quid. They have a built-in limiter switch which is great for softening the sound so the tones are not too loud for your ears, this works especially well for the high tones but leaves the grunts louder so you can determine what the detector is telling you. There is also a “mute” switch so when you’ve located your target and you put your metal detector down you’re not annoyed by the random bleeping and noise of the detector. Because these are the most expensive metal detector headphones on this list it is only fair that you receive the best quality and Killer B Wasp Optima headphones have not scrimped at all with the material they’ve used. The earpiece cups and headband are very well padded making them comfortable. They fit so well to your ears and completely black out any outside noise. The coil wire is extra long. Handmade in the USA they are perhaps one of the most well constructed and best-performing headphones available. Fully adjustable headband for sizing. The Garrett Treasure Sound metal detecting headphones are the smallest and most lightweight of the headphones we’ve listed, they are also the lowest priced. So small you will barely notice you are wearing them. I have a set of these as backup metal detector headphones and I like to use them more in the summer largely because of how they don’t enclose your ears totally and you don’t get sweaty ears! The headbands fully adjustable and fits well. They have an inline volume control on the lead so you can increase or decrease the volume regardless of whether your detector has volume level control. 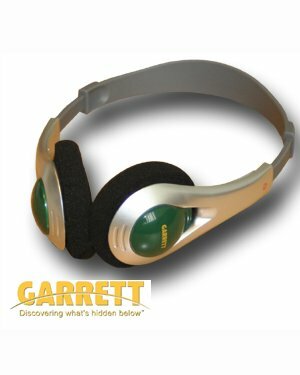 If you’ve got a very small budget then the Garrett Treasure Sound headphones are a great choice for metal detector headphones! I’ve tried to include a variety of the best metal detecting headphones for a range of budgets. Each and every set that I’ve spoken about are reliable and good metal detecting headphones. Your budget is going to probably make the decision, but if you have a larger budget I would highly recommend the Deteknix W3 Wireless headphones! You really can’t go wrong with any of them though, they are all manufactured to be used metal detecting and they all come with great reviews. If you’re a little more serious about your metal detecting then the headphones really can make a world of difference. Especially when using iron audio and other similar features.